Cattle family worksheet – Download this fun & FREE easy science for kids activity sheet on the cattle family. 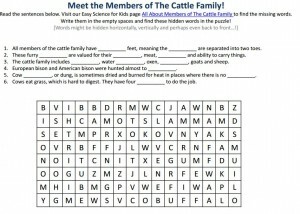 Our FREE fun all about Cattle hidden word-seek puzzle game for children is printable. This seek hidden words puzzle activity sheet on Cattle is a great way for kids to gain additional fun facts and learn easy science fun facts about Cattle. Our free to use cattle family worksheet is ideal for kids in first to fifth grade. Teachers and parents can use this all about cattle science worksheet as a reading comprehension activity. For kindergarten kids or Pre-k kids, you can use this free to download worksheet as a listening comprehension activity. Our kids science site offers many more fun and free online resources for educators. What are the Cattle family and its members? What are Cattle characteristics? What are furry mammals? What are cloven feet? You can find out more about Cattle with this worksheet. [sociallocker]Download the FREE Printable easy science worksheet about the Cattle family. Download the FREE Cattle Family Worksheet! Find out more info about Cattle here. Declan, Tobin. " Cattle Family - Free Easy Science Kids Activity Sheet - ." Easy Science for Kids, Apr 2019. Web. 25 Apr 2019. < https://easyscienceforkids.com/cattle-family-free-easy-science-kids-activity-sheet/ >.